Round two, laser edition! I’m once again joined by the badass Mr Hyde113, whose comments you can find in italics as per part one, which covered Gallente faction hulls. Oh, the Apoc Navy. 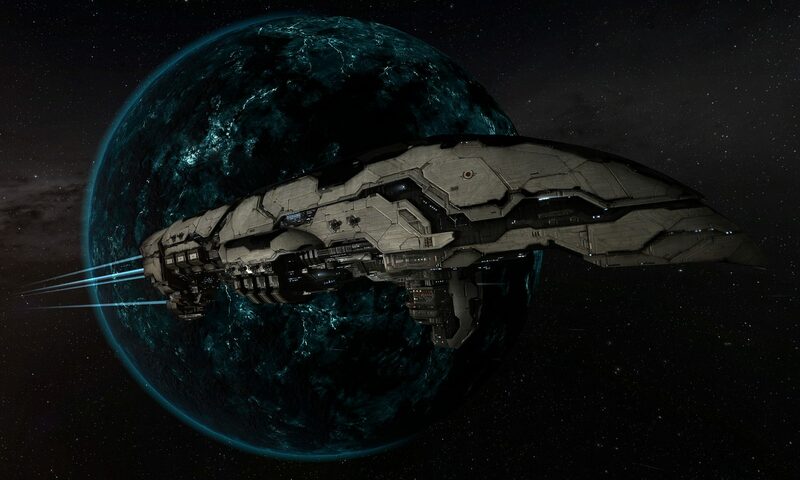 Rooks and Kings used it to great success alongside triage and pantheon carrier groups, and Pandemic Legion’s Foxcat doctrine became a staple of nullsec warfare. The hull remains remains great, apart from the fact that bombers exist. To be honest, I could happily stop there and move on to the ‘Geddon, but the editors would probably get mad at me so let’s get stuck in. Both hulls get a really cool pair of bonuses – 7.5% Large Energy Turret Optimal and Tracking per level. As I said in the previous article; a good way to tell if a ship is useful or not is if it has at least one of a) a projection bonus or b) a tank bonus. This hull has both projection and application bonuses, which makes it great for dealing with cruiser fleets. This is, admittedly, also due to it having a ton of lows for the highest EHP battleship armour tank, coupled with the incredible triage Archon reps, but we’ll get onto slot layout shortly. The regular Apoc has painfully low CPU, so the gain of 40tf seriously helps; the PG also goes up by 1000 MW (1250 after skills). as with most Amarr ships, even with an armour tank you still hurt for mids. The buffer increases massively from 36k to 55k EHP, gained mostly in hull and armour but some shields as well (please don’t shield tank your NApoc). The capacitor drops by 250 from 7750 to 7500, with reduced cap regen, though the cargo bay is huge, going from 600m3 on the vanilla Apoc all the way up to a whopping 700m3 on the Navy version. The NApoc gains 25 drone bay and bandwidth, 75 to 100 and 50 to 75 respectively, though the cargo bay drops by a whopping 50m3. The align time gain isn’t as much as we saw with the Gallente battleships, gaining only 0.4s align time from 10.8 to 10.4s. It does gain 9m/s base speed which actually scales up fairly significantly – a T2 MWD puts the difference at 1059 to 1125m/s. Sensor strength goes up by 25% to 30, as well as slight gains in lock range and lock speed. Sig goes down by 10m, again only really applicable when dreads are shooting you. Similar to the Navy Mega, the Navy Apoc is a beefier, better version for just over double the price, but here without a pirate battleship moving in on its role, as the Nightmare and Bhaalgorn are very different ships. Its main issue is the lack of a utility high and, as previously mentioned, getting sent to the ownzone by bombers in nullsec fleets. The Armageddon Navy Issue is statistically one of the least used ships in the game, even among the Navy Battleship line. It has the old-school Amarr bonus of 10% Large Energy Turret activation cost per level, a bonus whose upside is degraded somewhat by the second bonus: 5% bonus to Large Energy Turret rate of fire. Faster cycling means more cap use. Mathematically speaking, 5% RoF is a better damage output than 5% damage, but a 7.5% damage bonus would be much stronger. The cap bonus on the hull would mean more and it also means your volley damage increases significantly. The Navy Geddon suffers from bad laser tracking and limited mid slots. As an old school Amarr player, the Navy Geddon has a special place in my heart as a link to the past glory days of the old Geddon. See Kil2 aka CCP Rise’s old Geddon video. Although it is certainly a capable solo laser brawler given the right situation (See my Navy Geddon Clip), the flexibility of the current drone-neut vanilla Geddon almost always makes it the better solo choice in today’s meta. Like many old school laser boats (I’m looking at you, Absolution), the Navy Geddon suffers from bad laser tracking and limited mid slots. If given the choice, I would love to see the Navy Geddon get the “Navy Harbinger” treatment, increasing flexibility through increased mid-slots and a tracking bonus. 4) Dropping the laser cap usage bonus for tracking is slightly mitigated by reducing the number of turrets and swapping from RoF to Damage. It would also serve as a Navy middle ground between the Nightmare and Bhaalgorn, while not intruding on either of those ships niches. The NApoc would still be the prefered fleet boat given its eight turret slots, eight low slots and range bonus, so it wouldn’t really intrude on that, either. The regular ‘Geddon has a slot layout of 7/4/7; the Navy gains two whole slots going up to 8/4/8. The Navy Geddon has 7 turret slots, including a utility high which, to my knowledge, has never been more valuable on battleship hulls than in the modern age of bombers, ECM drones, and missile swarms. The regular ‘Geddon gets the 10% bonus to NOS and Neut optimal range and 5% to falloff, as well as a more flexible unbonused hardpoint configuration, with the option of five turrets or launchers reminiscent of the Dragoon. Core buffer goes from 42k to 55k, which is in line with other faction battleships. The regular ’Geddon has a fair bit of buffer to begin with so as a percentage increases it doesn’t seem as proportional to the other battleships. The regular ‘Geddon has a 10% hull bonus to drone damage/HP, so the drone bay actually drops from 275m3 to 200m3, retaining the same 125mbit bandwidth, which is still plenty generous and gives a good amount of versatility as well as the power of being able to drop five heavies. Base speed goes up a whole 6m/s, meaning the Navy variant is actually quite quick for a battleship – not in the same realm as the Barghest or Machariel perhaps, but speedy nonetheless. Align time remains the same at 12.8 seconds. Sensor strength goes up by around six from 25.2 to 31.2 (assuming max skills) and the lock range also gets a minor boost. The sig drops by 50 – just over 11% – which could mean real damage mitigation from capital sized weapons. As I’ve mentioned previously, some Navy ships are just beefier versions of their vanilla counterparts, as is the case with the Apoc Navy we discussed previously. This used to be true for the Navy ‘Geddon as well, before battleship tiericide turned the vanilla ‘Geddon into a neuting drone boat. If the Navy ‘Geddon had a balancing pass to put it in line with the Navy Harb and have it as a laser powered extension to the regular ‘Geddon it could make for a really cool ship, but for now it is stuck with a suboptimal slot layout and legacy hull bonuses that rob it of its potential badassery. Now, coverage of the Amarr faction battleship line would not be complete with discussing Omir’s Bhaalgorn and Sansha’s Nightmare. A web range bonus, infinite NOS, and a NOS/neut number bonus (with the flat laser damage increase to compensate for four turrets) make the Bhaalgorn a super cool hull. Much of the time, neut range tends to be more powerful than neut amount, though we still see relevance in WH flights, the Alliance Tournament, and as a utility ship in larger armour comps. We’ve also seen Chessur do some pretty cool solo Bhaalgorn stuff (one of which I paid for and proceeded NOT to get a shoutout in the video #NotBitter). The Nightmare is itself a super interesting ship, effectively a midslot-heavy version of what Mr Hyde would like to see done to the Navy Geddon, but with the unique afterburner bonus to distinguish it as a pirate boat. Really, not much is to be said for the comparison between the Navy Geddon and these two pirate faction battleships because the hull bonuses and slot layout make it a rather bland armour battleship. The Navy Apoc has those synergistic optimal and tracking bonuses which gives it a really cool role in fleet combat, but the ‘Geddon is just a little sad. Please CCP, #MakeGeddonsGreatAgain.